Chabad invites you to a Passover Seder that is interactive, thought-provoking and engaging for all ages and backgrounds. Celebrate with friends and family over a delicious dinner and enjoy insights, singing, four cups of wine, some horseradish, charoset and Matzah galore. 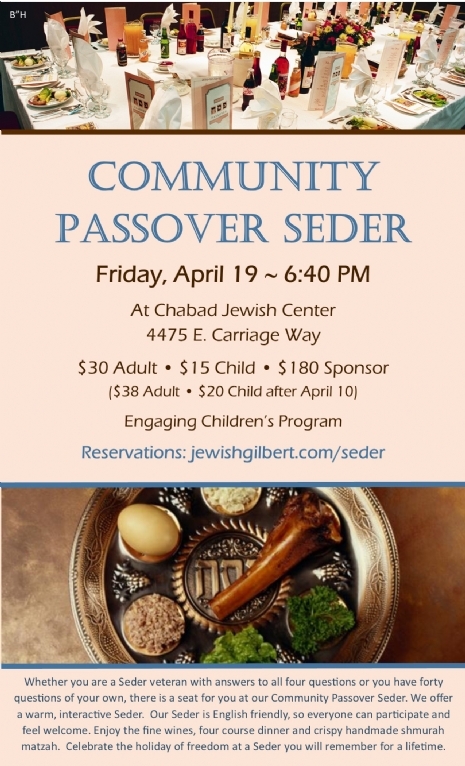 Whether you are a Seder veteran with answers to all four questions or you have forty questions of your own, there is a seat for you at our Community Passover Seder. Our Seder is English friendly, so everyone can participate and feel welcome. No one will be turned away due to lack of funds, please discuss this with the Rabbi if necessary.